My maternal grandfather was a bit of a role model to me. He wasn’t a regular grandpa; he was a “cool grandpa” — stylish, with money to spare. One summer at a family picnic in Sesquicentennial State Park in South Carolina, I spotted him in fresh, off-white linen wide-legged trousers, complimented by a flimsy white button-down and straw hat. I was 10 or 11 at the time and had never seen anything like those pants before. I was transfixed. Obsessed, even. I called them elephant-leg pants, and from there, I was intent on one day owning a pair myself and channeling some of that unique, premium style that my grandfather embodied. But proper wide-legged trousers weren’t easily accessible to me as a black kid living in a lower-income household in South Carolina. And they still aren’t today for many men in America, apart from shopping online or in a big city. “[They’re] mainly only in boutiques or specialty stores,” says New York designer Raun LaRose. LaRose first introduced the style to his line back in 2015 and included them in his latest collection at New York Fashion Week: Men’s, earlier this month, along with Todd Snyder, Michael Maccari for Perry Ellis and a coterie of other designers, indicating they’re making a comeback. “It takes a confident, cool and very aware-of-himself type of guy to wear them,” says Pierre Ellis (no relation to Perry), a New York model agent and disciple of the sumptuous leg. “You can’t be worried about what people think wearing these pants.” While Ellis first became a fan in 2015, he didn’t get a pair until a year or so later. Now, though, he has styles by Phillip Lim and Haider Ackermann in his closet. The wide-legged trouser has no clear origin, but by all accounts, the style was originally called “Oxford Bags” and came from London. Now, whether you believe they were the creation of some clever Oxford students hoping to skirt the school’s dress code in 1924 (they were not), or one of many tailors in the 1920s who hoped to stake a claim as the style began to trend after the 1924 Henley Regatta (also not true) is your prerogative. The closest truth: The first pair on record is from 1896 and essentially functioned as a sweatpants for rowers to keep themselves warm between races. The pants did have a moment in the 1920s, though, inspired by what reporters saw at the ’24 Regatta. After that, the cut became the style of the day for the Oxford set. Lord Birkenhead wore them in 1925, marking the pants as appropriate in high society and ushering in a mini-era of trousers that measured 22 to 23 inches in circumference at a time when 16 inches was typical. As the trend grew, those measurements ballooned to 40 inches. And while the style was eventually phased out in London, it did get exported around the world, with Parisian tailors getting requests for them and Americans rebranding them as “collegiate pants,” which were high-waisted and fell over your shoes. In more modern times, they came back as a subtle alternative to the 1970s flare, and were worn by the likes of David Bowie. 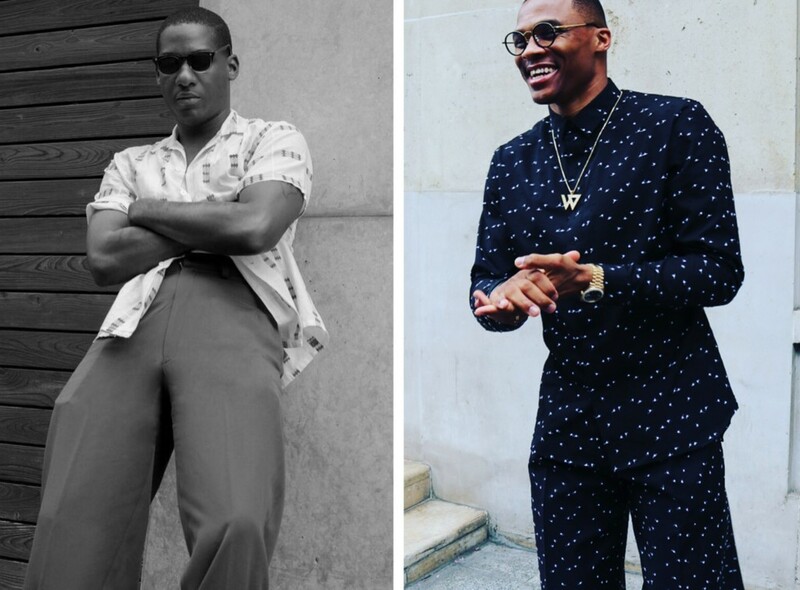 These days, everyone from Leon Bridges to Jude Law to Russell Westbrook is wearing them. Since I couldn’t find or afford a proper pair as a teen, I fashioned my own. Grabbing a pair of size 38 chinos from a thrift store, I put them on and cinched them to my then size 28 waist, bunching and folding the pants’ waist under a belt. It didn’t create the exact effect of my grandpa’s trousers, but it was close enough. Before I dared wear them to school, I took them for a stroll around the neighborhood and received a few interesting looks. And while I had big plans to wear them for all my friends in class the next week, they never returned from the family laundry bag as my mom put them in with my dad’s clothes; he, in turn, threw them out since they were too big for him. Designer Willy Chavarria’s versions from last season speak to that same aesthetic. “I grew up in ‘baggy,’ which was actually wide-leg,” says Chavarria; there is a distinction, as wide-legged trousers are tapered in the waist while baggy ones are not. As influence, the Mexican-American designer points to pachuco and cholo culture. “The idea was to buy workwear bottoms a few sizes too big and then belt them up so you had some deep pleats that created a silhouette that was wider at the hem. It was the streetwear version of early Yves Saint Laurent.” His take has included workwear trousers with a waistband full of buttons to cinch it in with the desired folds, but this season, the designer brought the silhouette back, sans folds but belting it with long black leather strips during his lowrider- and fetish-inspired show. I got my first real feel of actual wide-legged trousers on New Year’s Eve. I was in Portugal for the holidays, squirreled away on the second floor of a creative co-op space going through the racks of pieces in Hugo Costa’s studio. First, there was the navy pair with a thick winter fabric, high paperbag waist and tie closure. Then there was a silk pair: striped, a little less structured, but with a traditional belted waist. By the end of February I owned them both — though the paper-bag waist was removed. For the following three months they sat in my closet before a trip I took to Paris, where I finally worked up the courage to debut them in grand style.